The house is a study in simplicity—and problem solving. It was a tough site, says architect Jim Estes: “Not much room and close neighbors.” To make the most of the lot, he took the house up to the setback lines, which created a courtyard on the street side. 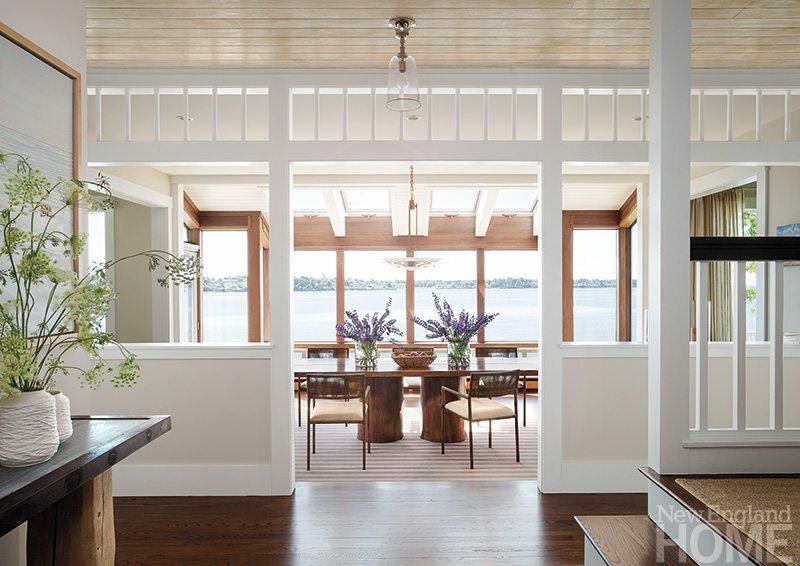 Lots of doors and fixed floor-to-ceiling windows blur the lines between indoors and out. The soothing neutral palette makes any touch of color pop, as seen in this bedroom. 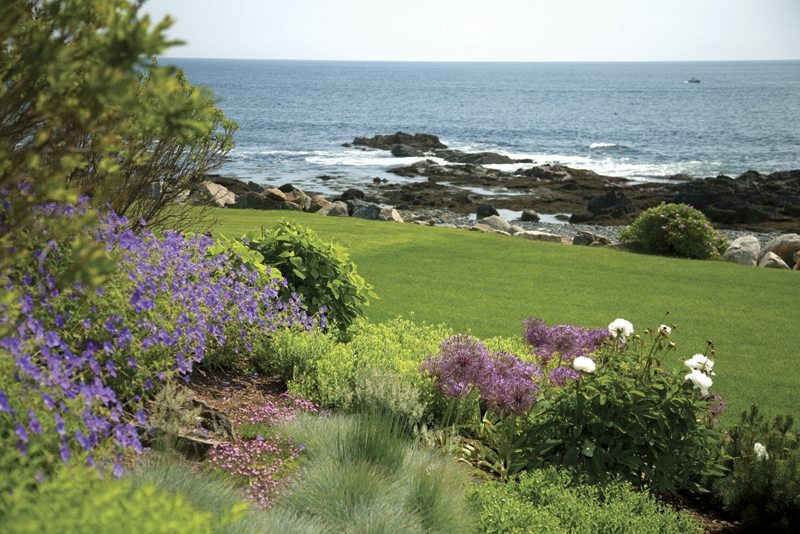 The natural landscape design incorporates an abundance of native plants; the long, bottom leg of the “U” (the back of the house) is oriented to take full advantage of the water views. Horizontal lines and a mix of light wood finishes, including walls clad in pale yellow sugar pine, contribute to the home’s seamless look. Slats and boards on the waterside deck mimic the interiors. The study, where Kramer and Celeste often take their morning coffee, shows off Murphy’s deft blending of the couple’s tastes—her preference for traditional and his for a more bohemian look. The large living room, outfitted to accommodate the homeowners and their six children as well as plenty of friends, has multiple seating areas scattered around a fireplace conceived and built by stone artist Lew French. 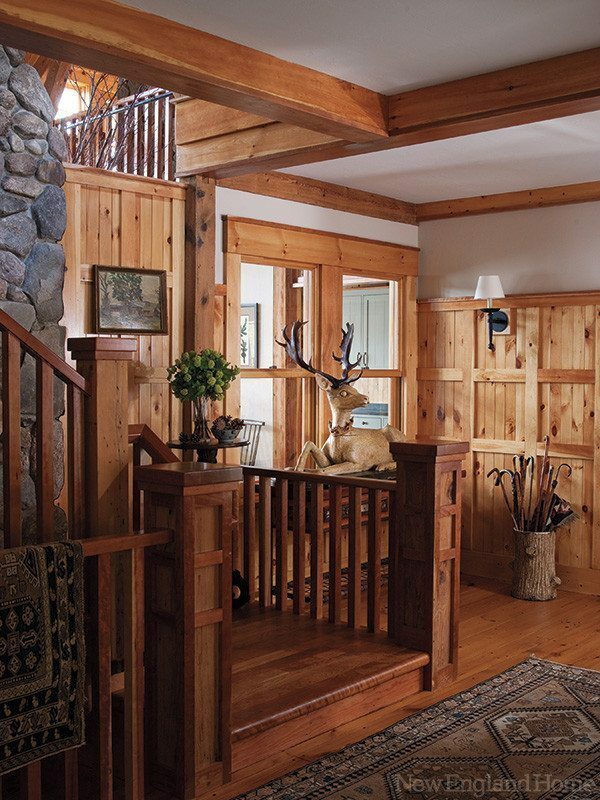 Layers of antiques and flea-market finds fill niches such as this one in the entryway. The rugged beauty of the ledge outcropping, now freed from year of vegetation, adds further drama to the waterside site. Building the deck only a few inches above the ground eliminated the need for a railing. The cantilevered design of the steel bed repeats the theme of the home’s architecture. A spiral staircase leads from the garage to the studio. A concrete plinth serves as a grand terrace for the walk-out lower level. Minimalist materials soften the home’s impact on the site. Sudbury Design Group’s landscaping plan includes a generous swath of hydrangeas that enhance the appeal of the handsome shingled house. 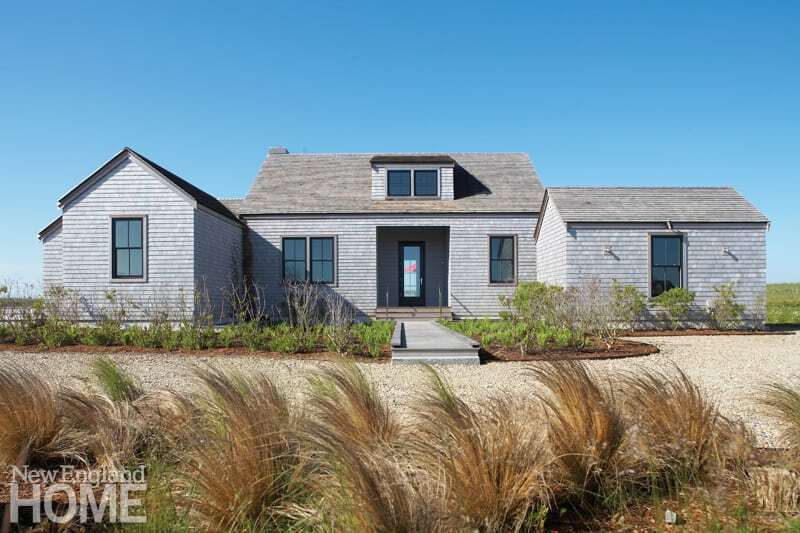 Architects Lisa Botticelli and Ray Pohl’s design incorporates the classic details beloved by Nantucket residents.